This May, the temperature in Minneapolis was lower than usual. So a place like Nicollet Mall, a prominent focal point for downtown activity, usually bustling on a warm mid-afternoon or early Spring evening, sounded and felt atypically subdued when I decided to go on my soundwalk. 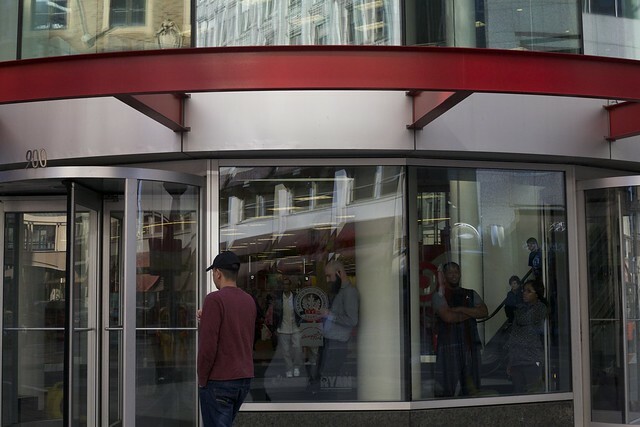 Nicollet Mall is sited at the intersection of 9th street and Nicollet Avenue and is anchored by the discount retailer, Target. Surrounding this behemoth, you’ll notice street performers, restaurants with modular outdoor seating, the walking family unit, public transit commuters, suburbanites and urban professionals. Passing through, these visitors make their way to or from their next destination; sometimes stopping for a few moments on this 12 block interchange. All of the sounds I hear are familiar to me: high-heels stomping past hinting at the corporate atmosphere of this place; conversations between friends; parents scolding their children; the howling wind amplifying the chilly weather; and the bus’ compression, which sounds like a sigh of both relief and exasperation, as riders come on and off. The interesting thing about this recording exercise for me was how this activity of replay triggered my own self-awareness. Some of the more prominent sounds included in this recording were my own. The plastic bags I held in my hand rustled from purchases I made at Target. The hesitant sound of recognition I uttered when I noticed someone I’d met and talked to before, riding a bicycle and heading south. I almost called out his name but in that moment, I forgot what it was. And finally, an impatient-sounding sigh, towards the end of the recording as I head to board the southbound 18 bus, signaling both a slight boredom with Nicollet Mall and the desire to retreat and head home after a long day. I hadn’t noticed my sigh during the recording, but it speaks volumes. Nicollet Mall, though centrally located, can become mundane and routine, when not broken up with interventions and programming. The city of Minneapolis makes some attempt at this throughout the year, most intensely during the warmer months, as a strategy to boost retail foot traffic and to create points of interest and a sense of place. Despite these efforts, however, Nicollet Mall continues to lack the latter. What the avenue needs is more diverse program options throughout the year, designed with input from its highest user groups: transit riders, young professionals, high school students and families. 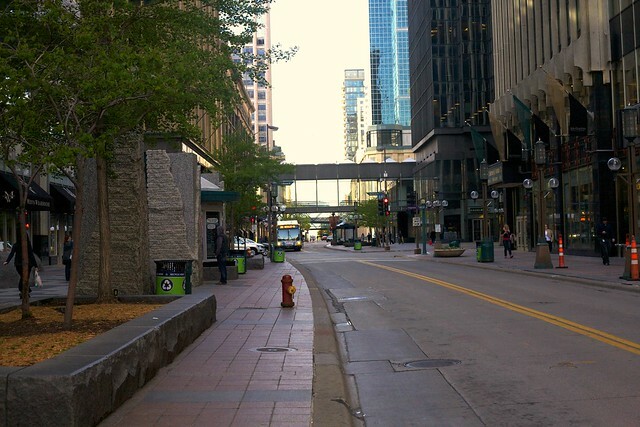 For better or worse, Nicollet Mall is one of the most important arteries in the city. It’s not just a thoroughfare. It is a place where I know I’ll likely meet someone that I recognize, utilize amenities like the bank and FedEx Kinkos and have easy access to the post office. And most importantly, because of its central location, at the end of the day, I’m but a few bus stops, bike pedals or miles on foot from arriving back at my neighborhood & home, my favorite place to be in the city of Minneapolis. For these reasons, Nicollet Mall is a site full of potential. Post and Photos by G. Adjoa Akofio-Sowah. Find her on twitter @sutotadakota . This is one of many posts where CoLab Radio contributors take readers and listeners on a soundwalk in their city. Read and listen to the yesterday’s soundwalk soundwalk from Istanbul, Turkey here. If you’d like to submit an example from your own city, see the easy steps here.